An especially harrowing season of flooding in Kazakhstan has displaced thousands and wrought widespread damage. The disaster response effort to date has been marked by public complaints and official recriminations. The floods, brought on by heavy rainfall and melting snow, have been felt most strongly in northern and central regions of the country. The government’s Committee for Emergency Situations was reporting on April 28 that just over two-thirds of the more than 10,000 people evacuated because of the flooding had been allowed to return to their homes. Almost 3,500 individuals either remain in temporary shelters or are living with relatives. Farmers have been the hardest hit. Some have lost entire herds of livestock, and with them their only source of income. The most dramatic stories have come out of Atbasar, a town around 270 kilometers west of the capital Astana. The sudden rupture of a dam there left the whole town under water, prompting authorities to declare a state of emergency. More than 400 homes were flooded. In the city of Aktobe and surrounding areas, meanwhile, some were forced to flee their homes in boats. There has been a fair amount of public grumbling over the way officials have handled the flooding. For example, in Aktobe, some have complained that a government commission tasked with damage assessment concluded, improperly, that flooded buildings were still habitable. The events are creating a public-relations challenge for the government. A video of 10-year old Aktobe resident Mahabbat Yesimova, whose house was destroyed in the floods, has attracted 100,000 views — a sizable number for Kazakhstan. “We gathered every penny we had for our home and now it has been taken away by the water. All my books and things are gone. I was worrying about my studies, and now we don’t even have a home. Why are they tormenting us in his way?” Yesimova says into camera between sobs. The tearful appeal for the government to do more was filmed and posted by Aktobe newspaper Diapazon and has since been shared widely by bloggers and on social media. In response to the outcry, local businessmen said that they would pay for a two-story house for Yesimova and her family. Not everybody is so lucky. Nasha Gazeta also created a video report of the aftermath documenting the damage. 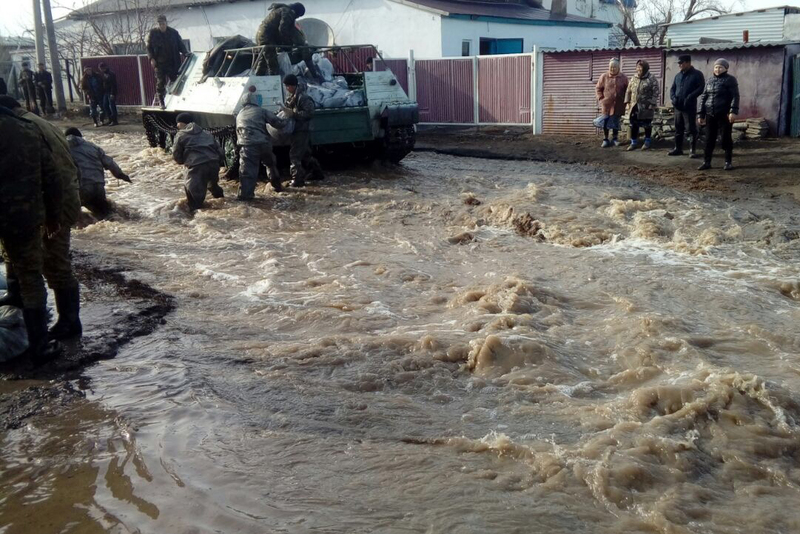 Flooding has even threatened the outskirts of Astana. In an effort to protect the capital, local authorities ordered water be pumped out of the Astana reservoir. But that move caused the Yesil and Nura rivers to break their banks and swamp the suburban villages of Talapker and Semyonovka. In the midst of the crisis, privately owned broadcaster KTK reported that the administration of the Tselinograd district, which surrounds Astana, had run out of money to cope with damage caused by flooding. The wealthy have not been spared. In the suburbs of the city of Petropavlovsk, three elite residential communities — Teplichnoe, Michurino and Ozernoe — were hit by overflowing waters. Among the homes suffering damage was one belonging to Petropavlovsk Mayor Marat Tasmagambetov. The officials ostensibly responsible for overseeing the rescue, mitigation and recovery effort have engaged in mutual sniping. Prime Minister Bakytzhan Sagintayev accused Malik Murzalin, the governor of the Akmola region, where Astana is situated, of failing to make proper preparations for the season. Interior Minister Kalmuhanbet Kasymov said that a criminal investigation has been opened into the bursting of the Atbasar dam. More than $640,000 was allocated to construction of the dam last year. Murzalin, in turn, heaped blame on subcontractors responsible for building the dam. Meanwhile, Deputy Interior Minister Yury Ilin pointed the finger at the Kazgidromet meteorological service, who he said had failed to properly predict the scale of imminent disaster. Kazgidromet did not take that lying down and instead accused officials of failing to own up to their inability to keep the public informed. Kazgidromet’s press service told EurasiaNet.org that agency officials had fully briefed other government bodies, down to the local level, on how the volume of snow this past winter had exceeded the norm by 60 percent. But, as weather forecasters conceded, predictions about the amount of water that would flow into reservoirs had indeed proven short of the mark. “The reason for the inaccurate … forecasts are [attributable] to the lack of observation points and the poor quality of technical equipment, which makes it difficult to monitor such large territories,” the Kazgidromet press office said. Critics complain that the government has long made a habit of being caught by surprise in flooding season. According to the Interior Ministry, which handles emergency situations, 10 billion tenge ($32 million) was allocated to stave off the crisis this year. The chairman of the Tabigat environmental union, Mels Yeleusizov, a onetime presidential candidate, said he had little faith in government preparedness. “Every year, the problem of floods will get worse and worse as we see the consequences of global climate change manifest in our region in the form of ever greater rainfall,” said Yeleusizov. Aktan Rysaliev is a pseudonym for a journalist working in Almaty, Kazakhstan.